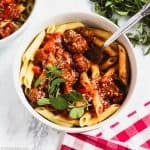 Bolognese sauce is a hearty and filling topping for gluten free pasta or veggie noodles, and now it's easier than ever to make. This simplified recipe is made in the slow cooker, with just 10 minutes or do of hands-on time. Plus, it is naturally gluten free, paleo, and Whole30 compliant! Preheat the oil in a large skillet. You can use your slow cooker, if you prefer, assuming it has a saute option. Add the onion and sautee until softened and translucent. Add the meat and break up into small bite-sized chunks. Saute until it begins to brown, but is still about half pink. Transfer the onions and meat to the bowl of your slow cooker. Stir in the carrots, tomatoes, and herbs and spices (all remaining ingredients). Cook on high heat for two hours. Serve over gluten free pasta or polenta, veggie noodles, or veggie mash. Used canned chopped tomatoes if you prefer a chunkier texture for your sauce. You can use turkey instead of beef. If you do, cook the sauce on low head for 3-4 hours.